Ordinary number signatures Banharn-Wijit UNC about 800 - 850 baht. Solid number set 1's - 9's signatures Sutee-Kamjorn UNC about 240,000 baht. The price was updated on 17th November 2017. 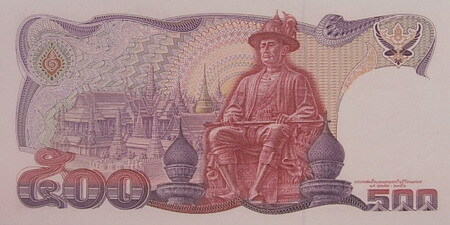 This 500 baht banknote reflects the royal activities of His Majesty King Rama 1. 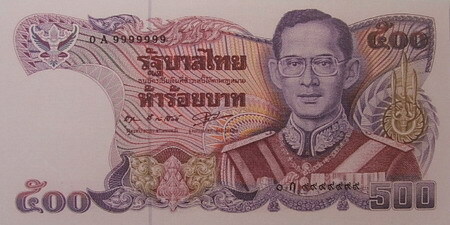 The banknotes were issued on November 5th, 1987. The majority design of the banknote also be used in the commemorative banknote on auspicious occasion of 90th birthday celebration of Princess Mother in 1990. The main object is the image of monument of His Majesty King Rama 1. The left side is the emeral buddha temple.